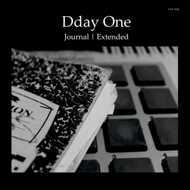 Dday One revisits Journal with a ten track extended version entitled Journal | Extended. The release features remastered versions of the original four tracks accompanied by six previously unreleased cuts. The tracks on Journal | Extended date from the same period, as the prolific Dday One was realizing a spectrum of sample-based experiments. Influenced by personal entries from Dday One's studio journals (one of which is pictured in the cover art), the music shows the producer constructing new musical possibilities within his unique style. Flipped beats and layered samples abound, placed in compelling arrangements that affirm Dday One's pensive attention to detail. Tracks like "Heiwa", evoking the melancholia of a traveler's search for inner truth, "Meaning", characterized by otherworldly tones and textures, and "Rhythm Section", with its playful introduction to the cut's instrumentation elements, are just a few highlights of this skillful selection. Journal | Extended was remastered by legendary Bay Area engineer Bruce Leighton, known for his work with Public Enemy and The Coup. The project also features photography by Dday One, including images of notes, ideas, and sketches from his studio journals. These photos provide an intimate look into the producer's creative process.